I love this project. And I love it when people love the film and write a nice review. The latest one comes from Aarhus, Denmark where Dorte wrote a wonderful review about this wonderful film. Sit back and relax, make a cup of tea, find a biscuit or two and step inside. Finally she arrived, this long-expected guest from London, who can make people change their lives dramatically. Ive been looking forward to seeing her for such a long time, and now she is here: The Girl is in Town! Had it not been for Ingrid, I might never have seen or heard about the film The Girl in the Caf?. But how can you know Ingrid and not know about this film? Hardly possible…. So on a sunny mid-September day the film (on DVD) reached my humble flat here in an ?rhus suburb called H?jbjerg. The odds weren’t good; my dear big-screen television had died just two nights before (while I was watching BBC Prime actually), so I was left with a small, old and non-stereo TV (colour, though). And right after I had received the DVD, a bad flu cached me with fever etc. So with painkillers, gallons of hot tea (Fortnum and Masons) and lots of Kleenex packets I sat in my Chesterfield Queen Ann Chair (can’t help it, – I just love that old English Style). At the very start of the film we meet Lawrence (Bill Nighy) getting ready for just another day at the office. Having breakfast, brushing his teeth etc. A usually day, or so we and Lawrence are supposed to think. But this morning symbolizes a new start, a new beginning. For Lawrence and eventually for millions of people on planet earth. Lawrence is an official, Whitehall (London), I recon. Middle aged and a traditionally Suit-man. He is probably good at his work (which includes A lot of papers. A lot of, um, pens), but socially he seems like a loner. Lives alone, eats his lunch alone at his own table and not with his colleagues. On this day Lawrence enters a caf? to have a short break and a cup of tea. Due to the many people in the caf? 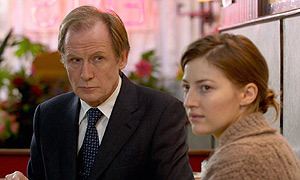 he accidentally sits down at a table, where a young girl, Gina (Kelly Macdonald) is sitting. Both seem to feel rather awkward about the situation. Lawrences amount of sugars in his tea (three on a bad day four) makes the occasion for Gina to start a conversation. The two are an uneven couple as they sit there. He the middle-aged very busy official and she the young girl with lots of time A student of a sort. But on the other side, they both seem to come from another planet as they sit there among the other guests in the caf?. Shy, uneasy and intense at the same time, which is underlined by the background music in certain scenes of the film, for instance when they meet for the first time in the caf?, Cold, cold water, by Damien Rice. A relationship takes its beginning on this day in the London caf?. Not an ordinary boy-meets-girl relationship, but a middle-aged-man-meets-young-girl one, like two lost souls meet in the dark of the night. (Which brings to mind remembrances of another film, Lost in Translation). But this is not just another love story. There are curtain political issues at stake as well. Lawrence and his colleagues are going to participate in the G8 Summit in Reykjav?k, Iceland. It’s 2005 and the real G8 Summit this year took place in Scotland. The fact that the Summit in the film has been placed in Iceland could be taken as a symbol of ice and ice melting, referring to the actual ending of the film. As a Senior Lawrence can bring a guest to the Summit, and he asks Gina to come with him. Obvious they dont know each other, Lawrence doesn’t even know Ginas surname, which appears in the scene at the reception desk in the hotel in Reykjavik. Actually there are many things he doesnt know about Gina. Due to a failure (?) Gina and Lawrence end up in a double room at the hotel, which makes both of them feeling rather awkward. But by and by, during the days in Reykjavik, things are unveiled between them, and at the same time between some of the participants at the Summit. At the end of the film things look a lot brighter, for Gina and Lawrence and for the lots of poor people in the 3. world. I liked the film very much, especially after seeing it for the second time. And I liked the music too, – this beautiful song Cold Water is still in my ears, long after the film went further off to the other side of the world (when you live in Denmark), to Australia. I didnt know the story, nor did I know the two actors playing the head roles Lawrence and Gina (Ive only seen Bill Nighy in a small part in The Constant Gardener). They do it very well in this film, and Id like to see both of them in other films in the future. Being an Anglophile it is always a pleasure to hear the English language spoken so well, as Bill Nighy and other actors do in this film. I never get tired of that. If you expect to (re-)view a lot of well known London spots, you might get a bit disappointed, – but instead you see those beautiful sights of the landscapes of Iceland. I hereby recommend The Girl in The Caf? to anyone who loves a good (love-) story with references to real life and political issues. About ordinary people who matter and who makes a difference. I hope to be in London in time to have a nice cup of tea in the caf?, before it closes down for good. Maybe I’ll see you there ? A Big Thank You to Dorte for participating. The Girl is on her way to the US now. Here is a list of people participating and if you want to be added to this list : read more here and join in. what?s wrong in the world. Bloglily – this is excellent news :-) Enjoy the film ! The Girl has Arrived from Spain. (Sounds like some MI5 code…) But it really has arrived! We will respond asap! Cheerio, Huub. By the way, where are all of your notes on scriptwriting posted? I am going to do a course in scriptwriting myself next year. Yay, thanks for update, and enjoy the film ! About my script writing notes, I haven’t really posted that much about it here to be honest. Well nothing serious at least.